Are you planning a kitchen remodel and want to be eco-friendly? You can easily create a healthy cooking and eating area for your family as well as help the environment. Gone are the days when green renovation was a novelty. Due to an expanding marketplace, smart green products are more readily available. You’ll find these products at competitive prices and in stylish choices, too. 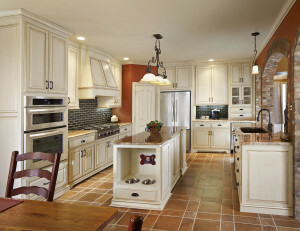 Eco-friendly kitchen cabinets are made from wood and wood products. They have formaldehyde-free glues and special finishes that give off little or no toxic fumes. Durable eco-friendly countertops are made of sustainable content. These offer low-toxicity binders, and eco-friendly manufacturing processes. Some beautiful slabs resemble limestone and soapstone, others are made of recycled glass, and still others are made of reclaimed wood. Beautiful flooring options like linoleum and cork can be found in showrooms. Both are made with renewable resources. Attractive and long-lasting, they do require periodic maintenance. Energy-efficient appliances that feature an “Energy Star” label are great for the planet and will also cut your utility bills. Choose a refrigerator model featuring the freezer on top; it will use 10% to 25% less energy than the typical side-by-side configuration. The above are green essentials for the modern, sustainable kitchen. By opting for environmentally-sound options in your new kitchen renovation, you are not only improving your family’s kitchen, you are contributing to the greater good.